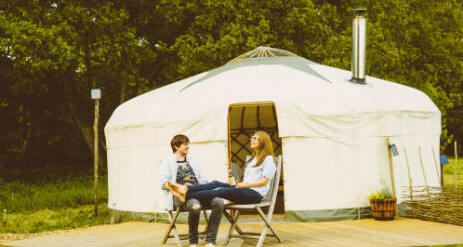 Round the Woods with glamping in yurts near historic Norwich in Norfolk is the perfect place to relax, explore and reconnect. 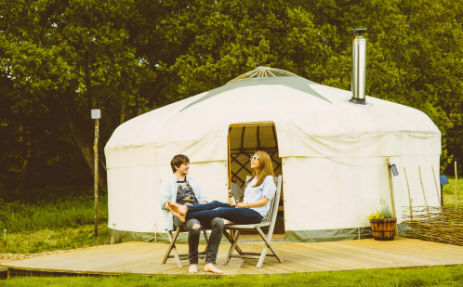 Whether you’re after a couples break or a fun-filled family holiday, we provide the perfect combination of back-to-nature camping with fuss-free glamping. 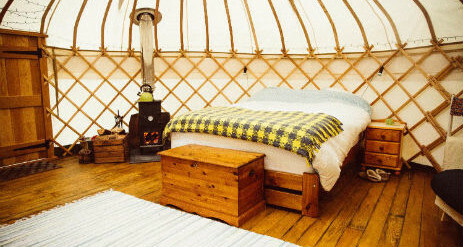 Our fully furnished handcrafted yurts provide everything you need for a comfortable and relaxing stay. Oak Tree and Hazelnut yurts each cater for up to 5 adults and an infant. Sleep soundly in the luxury king size bed with Hungarian goose down duvet and pillows, orthopaedic mattress with luxury topper and 100% cotton bed linen. We also provide soft blankets and throws for cosying up in front of the fire. Our beautiful yurts have a clear skylight for admiring the stars from bed. It also floods the yurt with natural light in the daytime making it a bright and welcoming space to relax in. A handmade woodburning stove will keep you toasty on chilly evenings & has an oven for cooking perfect jacket potatoes and warming casseroles. Plus there is a gas stove and kettle for that all important first cuppa in the morning. We provide everything you need for cooking and dining – all you need to bring is food! You arrive to a welcome hamper with locally sourced breakfast ingredients for your first morning. Wooden futons for comfortable seating that can be transformed into spare beds at night. Each yurt is furnished with two futons and an additional futon can be added. After dusk the yurt is beautifully lit with solar fairy lights and tealights. There are two fully furnished handmade yurts at Round the Woods, Oak Tree Yurt and Hazel Nut Yurt, each catering for up to 5 adults and an infant. Oak Tree sits under a line of mature oak trees and is basked in the morning sunshine, making for a truly wonderful experience to wake up to. Hazel Nut is nestled in a perfectly shaped clearing in the trees and receives the afternoon sun as well as a great view of Norfolk’s beautiful sunsets. 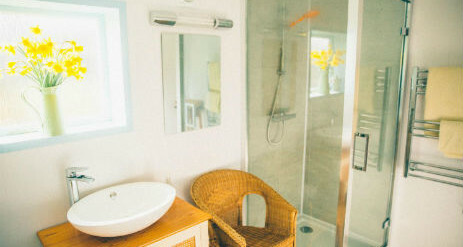 A private eco toilet alongside each yurt – no long walks in the night to go to the toilet! Round the Woods is the perfect escape for all the family, a real kids paradise and a special place for all to relax, explore and reconnect. Round the woods is a beautiful natural place to escape from the fast pace of everyday life. Watch the kids from the comfort of your hammock or settle down with the family by the cozy log fire. At the end of the day, you can climb into your luxurious king sized bed for a restful sleep ready for the next day’s adventure. Glamping is what we do and we love it. We know what you need for a relaxing stay and we’ve provided everything for you so you can concentrate on enjoying time with your family. Why not invite family or friends along? By booking both yurts you get the whole site to yourselves! 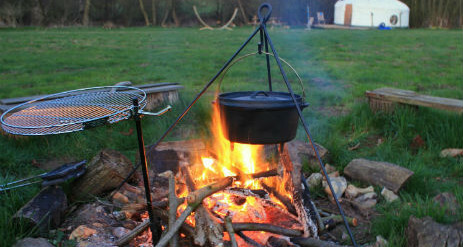 This makes Round the Woods ideal for small group bookings. Whether you are a group of two families or three generations of the same family we can provide exactly what you are looking for. 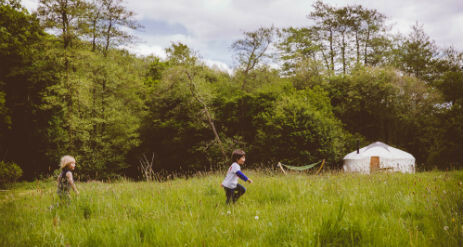 Children just love running between the yurts across the meadow and the central campfire provides an ideal spot for everyone to get together. 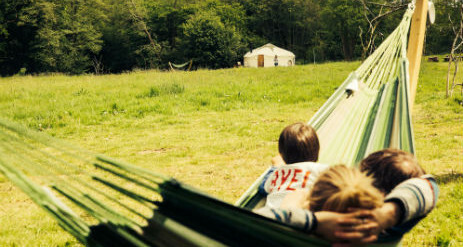 With just 2 yurts at Round the Woods and 80m of meadow between them you’ll have plenty of space to roam and relax. The apparent seclusion of Round the Woods helps to make such a relaxing, peaceful environment. You might be surprised to find that you are within easy reach of good pub food, supermarkets and top family attractions. Great days out include our neighbouring Dinosaur Adventure, Pensthorpe Natural Park and an abundance of wonderful beaches. Sometimes we need to celebrate being together. Sometimes we just need to slow down and make time to simply be together. Round the Woods gives you all you need to forget about the rest of the world and just relax together. Lie side by side in your hammock, picnic by the pond or snuggle up by candle light in front of the log fire. Enjoy peace, quiet and privacy. Our two yurts are positioned far from each other, giving you plenty of space to yourself. Embark on an adventure together. Step outside your yurt and you’ll find yourself embraced by natural, tranquil woodland. Stroll together among the trees and see if you can spot some woodland flowers or catch a glimpse of the local wildlife. Take a walk along the nearby Marriott’s or Wensum Way, taste local ales at friendly country pubs within walking distance. For a taste of culture, a shopping trip or simply to take in the UKs best preserved medieval city, vibrant Norwich city is just 20 minutes away. There is something irresistible about the magic of a yurt. The unique and exciting space is the perfect home-from-home, providing you with all the comfort needed to help you relax and unwind together, whilst also offering a special and unique ambiance that will ignite a true sense of romance. Escape your busy lives and simply find time to spend with each other.